What is the easiest and cheapest way to translate software to another language? The method that Facebook, Twitter and an increasing number of others are employing is translation crowdsourcing. It means having the enthusiastic software users translate the software, usually for free. Thanks to Multilizer localization tool, translation crowdsourcing is now available to anyone. Translation crowdsourcing is a good method when saving translation cost is important. For example, let’s assume you have developed a great piece of software. You have many users in many countries. Your software is currently in only one language and if the translation cost wasn’t so high, you would like to have the software translated to other languages. That would both benefit your current users and increase the number of your users and your earnings. Enter translation crowdsourcing! The software developer lets Multilizer analyse the software and find the text-to-be-translated inside the software. Multilizer uploads the text-to-be-translated to Internet. The software developer calls his users/translators to participate in the translation (in web). Translators use web-based Google Translator Toolkit to write their own translations. After the translation is finished, the developer lets Multilizer build translated version of the software. Translation crowdsourcing is a very simple and cost-efficient method for expanding sales and increasing user satisfaction. With MOTO, software translation can be crowdsourced in 5 minutes. The translation crowdsourcing process could not be any simpler! A translator gadget can be many things, but the Translator Gadget is a small translation software. Translator Gadget can translate short pieces of text automatically from one language to another. There are dozens of languages supported for translation and also the Gadget itself has been translated to many languages. In addition Translator Gadget can tell you how good the translation is. This automatic translation quality checking estimates the translation quality for you. Green color means that the translation is probably good. Yellow color will instruct you to be cautious and to proofread the translation carefully. Red color indicates that you probably should not use the translation without proper proofreading by a professional translator. 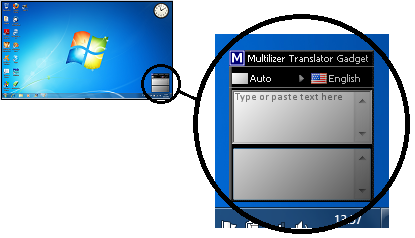 Translator Gadget is designed for Windows Vista and Windows 7 desktops. After installation it can easily be located in the desktop sidebar (see the picture). Because the Gadget is on your desktop where you can find it anytime you need to translate something, it is extremely useful tool. It won’t be lost in your programs and files. And the best thing: Translator Gadget is FREE. That’s right; you can download and use it without any fees or payments. Updated information 27th December, 2011: Unfortunately Multilizer Translator Gadget is no more available. 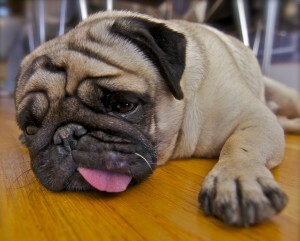 For reasons beyond our control, we cannot maintain the gadget anymore. We thank you all the users! If you need a translator for PDF document, try Multilizer PDF Translator. If you need to localize software or documents, try Multilizer Localization Tools. It’s amazing how fast machine translators are being developed. The quality of automatically translated texts is improving rapidly, which makes the machine translations more useful for several cases and situations. Constantly improving quality of machine translation has inspired people to invent some totally new and amazing translation technologies. Unfortunately there are still very limited group of languages supported in this new technology. English and Spanish seems to be working quite good already, but more languages are desperately needed to make this technology popular worldwide. Probably this will be changing but the pace of the development is a matter of crystal ball. Have you already tried camera translators?